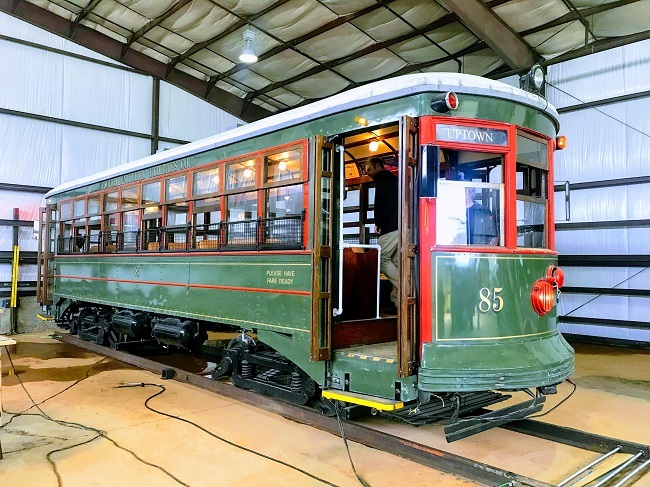 “I’m very excited to report that, for the first time in 5 years, Car 85, Charlotte’s last remaining original streetcar, operated under her own power again yesterday. Here’s a photo of her with the interior lights on and a quick video showing the car moving down the rail. This marks a big moment for Lakewood Trolley, the Historic Landmarks Commission and the neighborhoods of Historic West End, but it is only the beginning. We’ll await the final report from GOMACO, but overall the operating systems of the car are in good condition. Next stop…Stewart Creek, Cedar Street and Bank of America Stadium! Big thanks to CarolinaCAT for loaning us the generator, Lee Underwood for his expertise and testing oversight, Nate Wells and Belmont Trolley for use of their rectifier, NCDOT for the sticks of rail, Jay Donaldson from Griffin Brothers, John Tarr from GOMACO and L.S. Williams electricians for all of their work in getting the electrical and track sorted for this test. This was truly a group effort. a. Revisions to COA 17-59 for the Delburg Mill House, 303 Delburg Street, Davidson, N.C. 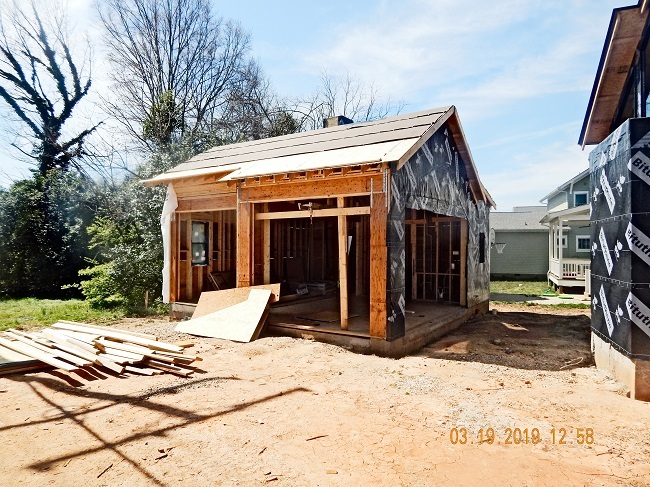 THE DESIGN REVIEW COMMITTEE PRESENTS A SECONDED MOTION TO THE HISTORIC LANDMARKS COMMISSION THAT IT APPROVE THE REVISED PLANS FOR THE DELBURG MILL HOUSE GARAGE, 303 DELBURG STREET, DAVIDSON, N.C., AS SUBMITTED WITH THE CONDITION THAT THE OVERHANG BRACKET BE REMOVED FROM THE PLAN. 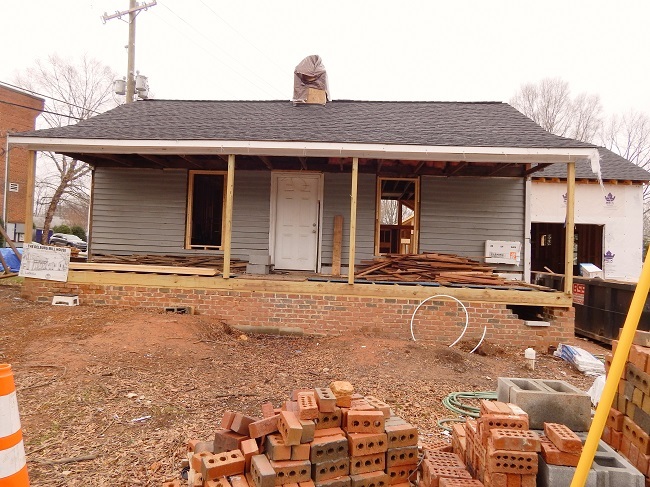 b. COA Application for the Lambeth-Gossett House, 923 Granville Road, Charlotte, N.C. THE DESIGN REVIEW COMMITTEE PRESENTS A SECONDED MOTION TO THE HISTORIC LANDMARKS COMMISSION THAT IT APPROVE THE PLANS FOR THE LAMBETH-GOSSETT HOUSE, 923 GRANVILLE ROAD, CHARLOTTE, N.C., AS SUBMITTED WITH THE FOLLOWING STIPULATIONS: 1) THAT THE PROPOSED MASONRY BASE OF THE COOKING AREA SHOULD NOT BE APPROVED AND THAT A DESIGN FOR A CABINET OPTION FOR THE OUTDOOR GRILL WOULD BE SUBMITTED TO THE HISTORIC LANDMARKS COMMISSION; AND 2) THAT THE FINAL DESIGN OF THE PITCH OF THE HIPPED ROOF SKYLIGHT BE APPROVED BY HLC STAFF AND THE DESIGN REVIEW CHAIR. c. COA Application for the First National Bank Building, 110 and 112 South Tryon Street, Charlotte, N.C. 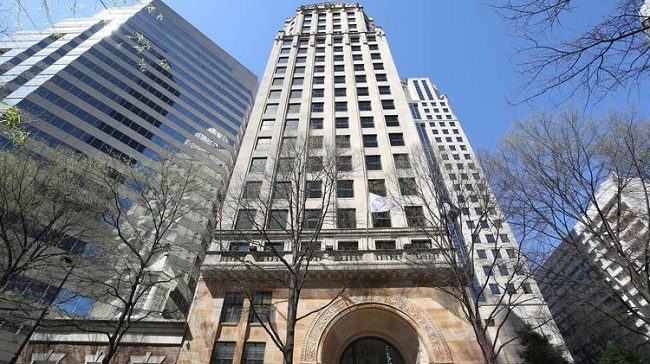 THE DESIGN REVIEW COMMITTEE PRESENTS A SECONDED MOTION TO THE HISTORIC LANDMARKS COMMISSION THAT IT CONCEPTUALLY APPROVE THE GLAZED OPENINGS ALONG THE WALL FOR THE FIRST NATIONAL BANK BUILDING, 110 AND 112 SOUTH TRYON STREET, CHARLOTTE, N.C., WITH THE CONDITION THAT REFINED PLANS WILL BE RESUBMITTED TO THE COMMITTEE FOR FURTHER REVIEW. a. Consideration of the Survey and Research Report on the Louise Cotton Mill House, 1104 Pamlico Street, Charlotte, N.C. THE PROJECTS COMMITTEE PRESENTS A SECONDED MOTION TO THE HISTORIC LANDMARKS COMMISSION THAT IT: 1) ACCEPT THE OFFER OUTLINED IN THE TERM SHEET AND AGREED TO BY REGINA AND TYSON BATES FOR THE PURCHASE OF THE TORRENCE LYTLE SCHOOL, 302 HOLBROOKS ROAD, HUNTERSVILLE, N.C., AND 2) ALLOW THE PROJECTS COMMITTEE TO NEGOTIATE AND APPROVE THE TERMS OF THE PURCHASE AND SALE AGREEMENT BASED ON TERM SHEET AND DELEGATE NEGOTIATION AND APPROVAL OF ANY SUBSEQUENT CHANGES TO THE TERMS OF THE PURCHASE AND SALE AGREEMENT TO THE HISTORIC LANDMARKS COMMISSION CHAIR AND THE PROJECTS COMMITTEE CHAIR. 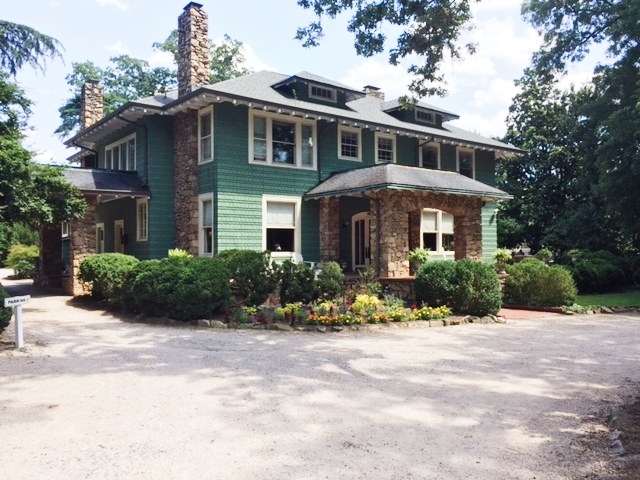 b. Barnhardt House, 3217 Maymont Place, Charlotte, N.C. 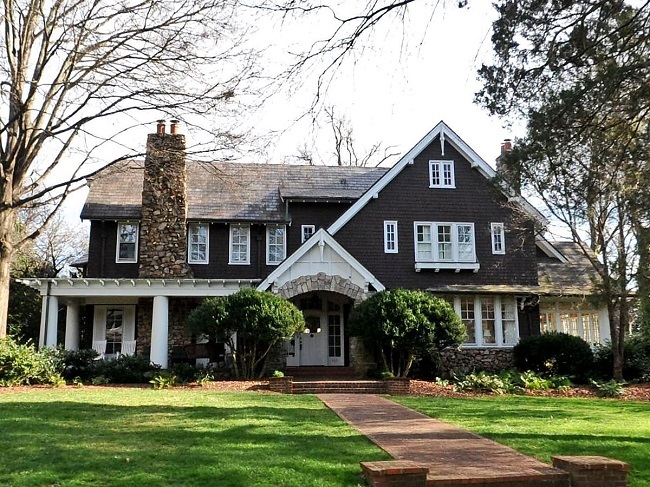 The Commission will consider the sales price of the Barnhardt House.